The post-judgment interest rate is the weekly average one-year constant maturity Treasury yield for the calendar week preceding the date of the entry of judgment. Effective December 21, 2000, the rate of interest that may be added to a judgment is subject to the provisions of 28 U.S.C. §1961, 18 U.S.C. §3612, and 40 U.S.C. §3116 (formerly cited as 40 U.S.C. §258e-1, August 21, 2002). The Board of Governors of the Federal Reserve System releases Selected Interest Rates (Weekly) - H.15, which lists current releases, a daily update, and historical data. Also available is the National Judgment Network (NJN) Post-Judgment Interest Calculator. 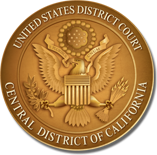 Beginning December 1, 2014, attorneys filing new civil actions will be required by amended Local Rule 3-2 to file their case-initiating document(s) electronically, using the Court’s Case Management/Electronic Case Filing System (CM/ECF), unless exempted from electronic filing by amended Local Rule 5-4.2. Please view the Notice From the Clerk for additional information. Please note that CM/ECF Account requests may take up to 2 business days to be processed. Attorneys are required by Local Rule 5-4.8.1 to maintain and update their personal contact information in CM/ECF. For instructions on how to update your profile, please click this link.